no longer Kellsee, but what if I enjoy wearing these fake glasses around the house just for fun? Last week, Rostam Batmanglij shared a new solo single. 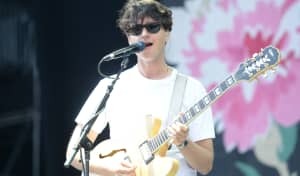 Today he declared his intention to leave Vampire Weekend and strike out on his own. "I wanted to let ppl kno I'm no longer a member of VW," he wrote on Twitter. "Ezra and I will continue to collaborate on future projects + future VW songs." "My identity as a songwriter + producer... needs to stand on my own," he continued. "There is so much amazing music—all of it dear to me—on its way to you." Batmanglij has collaborated with a number of other musicians already, including Carly Rae Jepsen and Charli XCX. Read his full statement below. Update (1/26 6:00 p.m.): Ezra Koenig posted an Instagram with his thoughts about Rostam's exit from the group and said work on their 4th album will continue. A couple years ago, Rostam and I sat down at his house & talked abt whether our collaboration was dependent on being members of the same band. We both firmly agreed that nope, it was not. In fact, we agreed that our collaboration was more important. I'm psyched about the work we've already begun for LP4 and I'm psyched to hear anything else Rostam is a part of. Also very excited to continue playing music with CT and Baio but there will be plenty of time to talk about that later in the year. For now in the Vampire Weekend universe, it's all about recording the next album. There will be a lot of familiar faces in the studio but also some fresh, new ones. Working title is "Mitsubishi Macchiato"...for obvious reasons. Shout-out to the fans who have been waiting for new music - it's coming. 🙏🏼🙏🏼🙏🏼 Also tomorrow, we gotta talk abt Iowa.